MI6 says entire world is threatened by this latest Russian ‘provocation’. 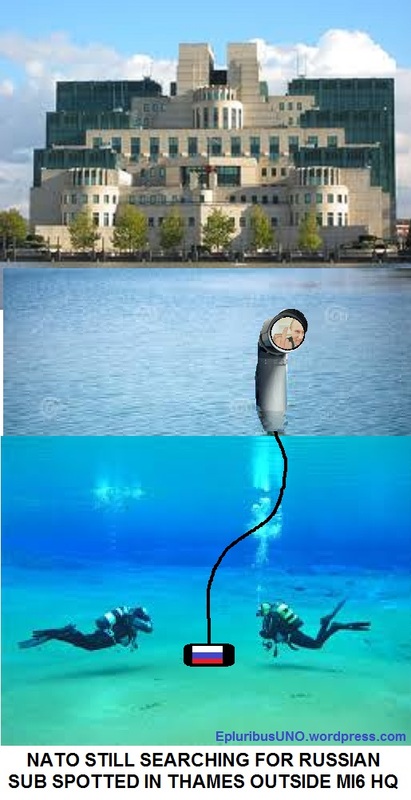 A periscope, reported by knowledgeable American tourists as “definitely” that of a Russian submarine, was spotted outside Parliament, and under the Vauxhall Bridge, outside MI6 Headquarters. NATO immediately proposed a massive sale of battleships to Czech Republic, Austria, Slovakia, Moldova, Switzerland, and Lichtenstein. “All the rivers of Europe are now vulnerable to the Russian war machine” says NATO SACEUR, General Philip Breedlove. When asked for comment, UK PM David Cameron, said he felt morally obligated to consult with the Monarchy before discussing any dinosaur-related strategic defense issues. Meanwhile, in Moscow, Russian President Vladimir Putin said NATO’s latest accusation was ridiculous, but it had “buoyed” his spirits.